* Bluetooth connected speakers appear in the Bluetooth settings and the Sound settings of System Settings with a broken icon. * This change simply moves the missing icon in to the default set. * Pair a Bluetooth speaker via the Bluetooth section of System Settings. * Once paired open the Sound Settings of System Settings and note that the Bluetooth speaker is displayed with the same speaker icon and not the broken icon. * Very low. This patch simply adds the missing icon to the default set. Request in with design for an icon. Failing that we could reuse the panel icon. 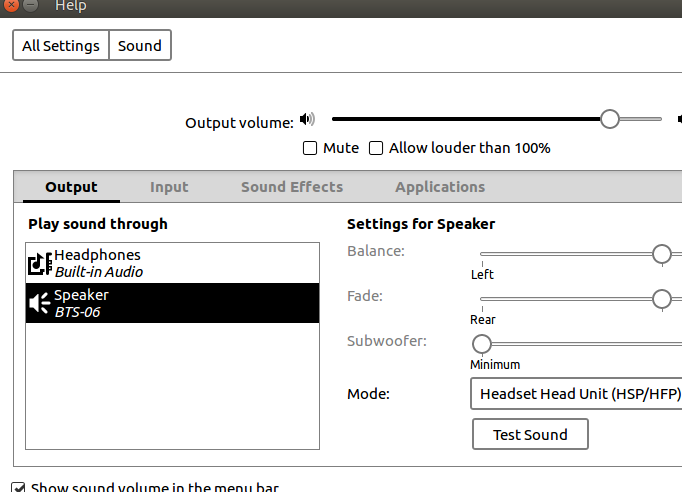 Turns out we just need to add the audio-speakers icon from the full icon set to our default on. Move audio-speakers from the full theme to the default one. Accepted adwaita-icon-theme into xenial-proposed. The package will build now and be available at https://launchpad.net/ubuntu/+source/adwaita-icon-theme/3.18.0-2ubuntu3.1 in a few hours, and then in the -proposed repository. Confirming this fixes the bug. Tested on a fresh-ish 16.04 install and upgraded via proposed. The verification of the Stable Release Update for adwaita-icon-theme has completed successfully and the package has now been released to -updates. Subsequently, the Ubuntu Stable Release Updates Team is being unsubscribed and will not receive messages about this bug report. In the event that you encounter a regression using the package from -updates please report a new bug using ubuntu-bug and tag the bug report regression-update so we can easily find any regressions.